Changes to my lifestyle to be more healthy and fit involves more than just exercising more. Less Tex-Mex, fewer pizzas, and more healthy stuff for breakfast, lunch and dinner. I’m always trying to integrate new recipes and foods into my diet, and a few occasionally stick out as both easy to put together and pretty darn tasty. I definitely want to highlight a few here, starting with a delicious (albeit a bit simple for some people) turkey sandwich recipe. Spread the mayo on one slice of bread and the mustard on the other slice. Lay 2 pieces of the turkey on one slice of bread so that it covers the whole slice. Lay on the two pieces of cheese, then top with rest of the turkey and finally the other slice of bread. Measure out the baby carrots (I just use a large handful, though). Wrap the sandwich in a paper towel and put in a Ziploc bag. Put the carrots in another bag or small Tupperware container, and you have a healthy, portable lunch! Like I said, it’s a pretty simple recipe, but I love it and probably have it a couple times a week. 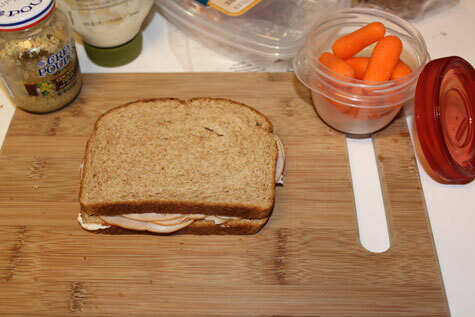 You can include a banana or salad with low-cal dressing for a bit more balance, but for me, turkey sandwich and carrots make a great, medium-sized meal.